Our spacious rooms are all en-suite and incredibly comfortable. All have extra-long beds, to accommodate tall people! Each room has its own seating area. 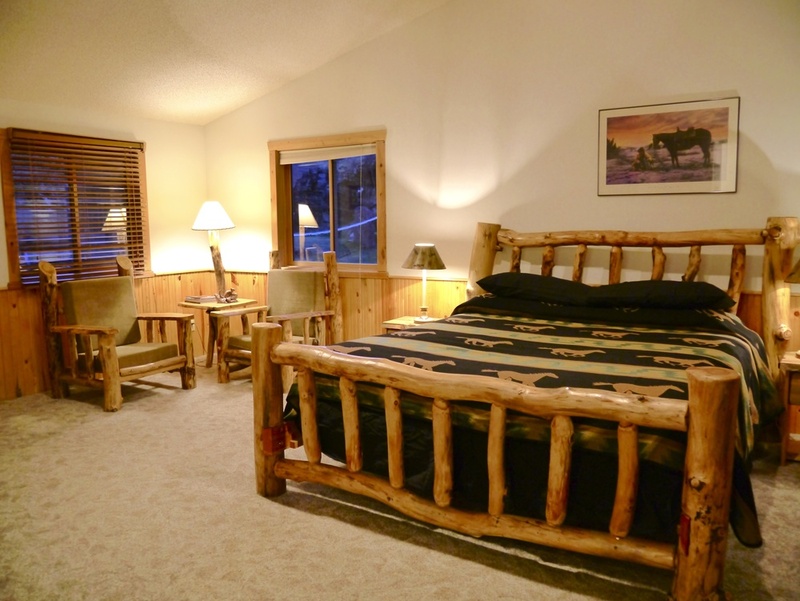 Excepting the lodge rooms, the rooms are warmed by their own natural gas fireplaces. There are two guest buildings. Referred to as the Lower and Upper, because one is up a small rise. Both buildings have four en-suite rooms, all possessing their own natural gas fireplace. Each room is named after a local historical figure. The Upper Building is attached to the guest laundry facility and the outdoor hot tub, and has a view of the mountains of field. The Lower Building has air-conditioning, and overlooks several of the horse corrals. Malcolm Clark - Possessing one queen-size bed and one twin-size (single) bed. Three Mile Charlie - Three twin-size (single) beds. Henry Sieben - Two Queen-size beds. James Fergus - Large California King Bed. Nicholas Hilger - One Queen-size bed and one twin-size (single) bed. Bernard Barnes - One Queen-size bed and one twin-size (single) bed. Fanny Sperry Steele - One Queen-size bed and one twin-size (single) bed. , as well as a double futon. General Sherman - California King Bed and a single futon.